Figure 1. Proposed Mendocino Ridge survey area. Bathymetric data coverage from 2009 EX0903 survey onboard the NOAA Ship Okeanos Explorer. Image courtesy of the NOAA Office of Exploration and Research. Download larger version (jpg, 147 KB). From September 23 - October 12, 2014, NOAA and University of New Hampshire scientists aboard the Woods Hole Oceanographic Institution-operated Research Vessel Atlantis will conduct a 16-day mapping expedition to the Mendocino Ridge off the coast of northern California. Scientists will sail from Astoria, Oregon, and end in San Francisco, California. Seafloor bathymetry and acoustic backscatter data and high-resolution sub-bottom profiles will be continuously collected during the expedition. The new data will improve seafloor maps of the area and contribute to the efforts of the U.S. Extended Continental Shelf Project, a multi-agency project to delineate the outer limits of the U.S. continental shelf. Overview map of features in the Mendocino Ridge area. (Adapted from EX0903 Cruise Report ). Download larger version (jpg, 275 KB). 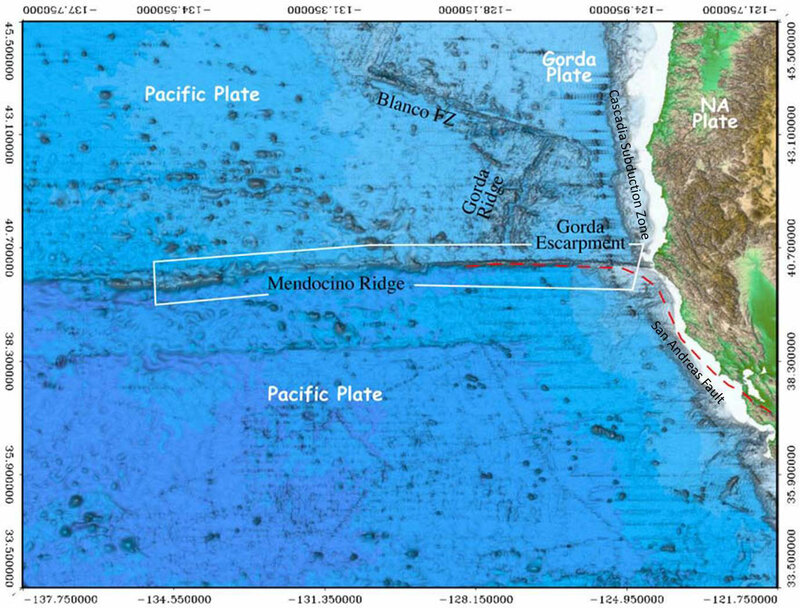 Mendocino Ridge is a narrow feature on the seafloor associated with the Mendocino Fracture Zone, which extends more than 5,000 kilometers across the eastern Pacific Ocean. Mendocino Ridge strikes westward from North America and in places stands more than one kilometer above the ocean basin floor. Geologically, the seismically active eastern-most portion of the ridge, known as the Gorda Escarpment, is the plate boundary between the Pacific to the south and Gorda Plate to the north and is an area of frequent earthquakes. North of Mendocino Ridge, the Gorda Plate underthrusts western North America along the north-trending Cascadia Subduction Zone. To the south of Mendocino Ridge, the Pacific Plate is overridden by and accreted to the North American Plate margin along the San Andreas Fault Zone, a north-northwest trending, right-lateral transform boundary where two boundaries slide past each other. The junction of the Pacific Plate, Gorda Plate, and North American Plate presently near Cape Mendocino forms a classic triple junction (area where three tectonic plates come together) that has migrated north with time. 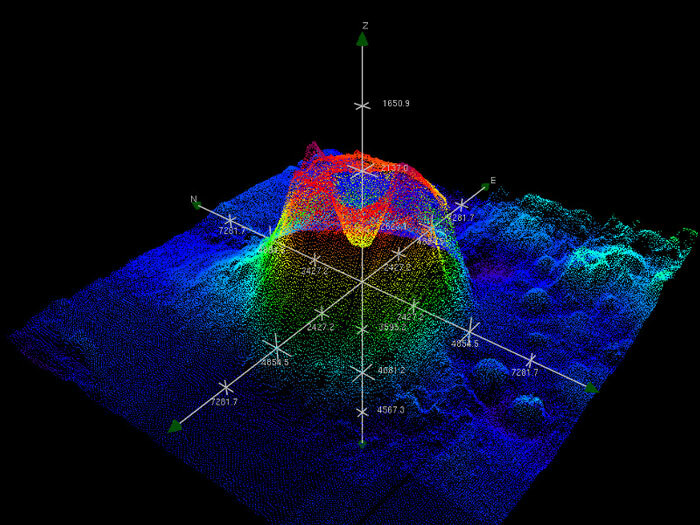 3D view of the SW side of an unnamed volcano with 40-degree slopes. View more 3D imagery at Center for Coastal and Ocean Mapping . Download image (jpg, 135 KB). 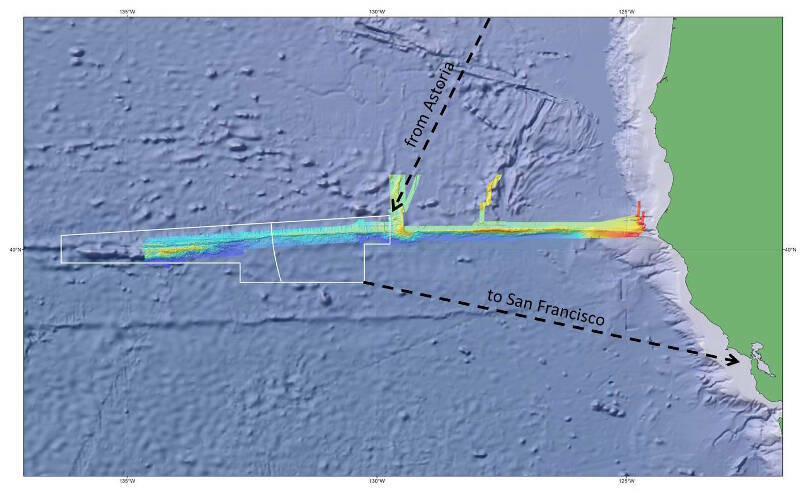 In 2009, NOAA Ship Okeanos Explorer collected high-quality multibeam bathymetry and acoustic backscatter data of the eastern-most portion of Mendocino Ridge. Data from the 2009 survey are currently being analyzed to expand our knowledge of the depth, shape, and geologic characteristics of the Mendocino Ridge. During this year’s expedition aboard R/V Atlantis, project scientists will collect similar data to the west of the previous Mendocino Ridge data and over the volcanic lobes at the base of its southern flank. The Mendocino Ridge Exploration Project will produce high-resolution maps that will contribute to scientists' understanding of geologic processes along this active plate boundary on our Pacific Coast. These maps will also be a valuable guide for planning future exploration and research expeditions. The bathymetric and backscatter data collected on this expedition will contribute to the U.S. Extended Continental Shelf (ECS) Project. The mission of the U.S. ECS Project is to delineate the outer limits of the U.S. continental shelf, consistent with international law. The U.S. ECS Project signifies the largest and potentially most significant interagency marine mapping survey ever undertaken by the United States. The data collected by NOAA and University of New Hampshire scientists aboard R/V Atlantis during this exploration will improve our understanding of the unique geology of the Mendocino Ridge as well as contribute to national continental shelf mapping priorities. All collected data will be available in NOAA’s public data archives within 30 days of the conclusion of the cruise and will be accessible via the OER Digital Atlas and NOAA’s National Geophysical Data Center. In 2009, the NOAA Ship Okeanos Explorer collected high-quality multibeam bathymetry of the continental margin just north of Mendocino Ridge. While the ship was testing its sonar, it suddenly imaged a 1,400-meter-high plume that rose from the seafloor. 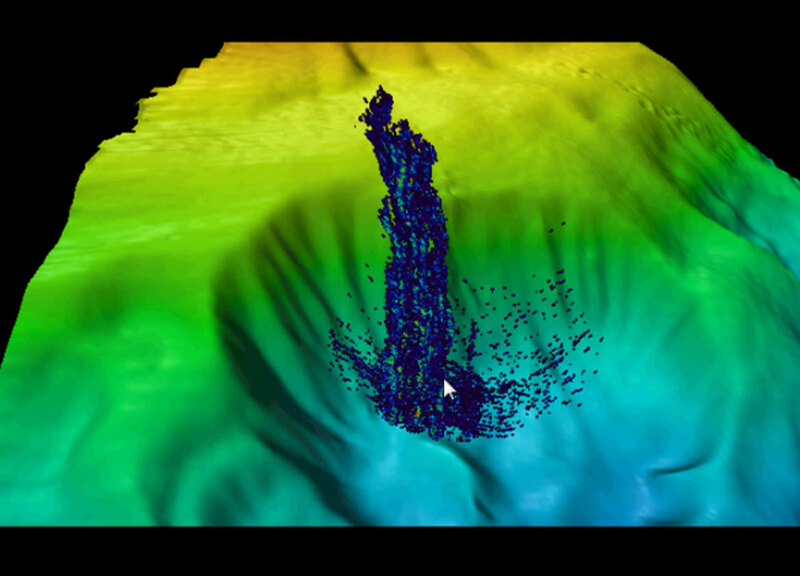 The digital terrain model created from the multibeam bathymetry shows that the likely methane plume rises from the base of a large, previously unknown, amphitheater-like feature. For additional information on the discovery, please see EOS, 2011 article . Screen grab of the multibeam echo sounder water column display showing the plume (red arrow). The horizontal axis is across-track distance, and the vertical axis is water depth. The somewhat horizontal white line embedded in the red band is the seafloor acoustic return. The plume disappears from the water column at roughly 400 meter water depth. Image courtesy of the NOAA Office of Ocean Exploration and Research. Download larger version (jpg, 94 KB). Gas plume rising from the base of a large, amphitheater-like feature. Image courtesy of NOAA/University of New Hampshire. Download larger version (jpg, 96 KB).